Sarah is a 17 year old paint mare who was showing signs of windup pain and discomfort while tacking up. She is used for lower level dressage and was previously diagnosed with arthritis in the right front leg and pituitary pars intermedia dysfunction (PPID) by her previous veterinarian. She received five acupuncture treatments, in addition to chiropractic, laser and some western medicine diagnostics/treatments between November 2017-January 2018. She responded very well to treatment and is currently doing well. A couple years ago, Sarah displayed discomfort while tacking up. At that time, she was used in an English riding lesson program for beginner riders. When the girth was applied, she appeared nervous, would swish her tail and pin her ears. This behavior was resolved when a better fitting saddle was used, and no treatment or diagnostics were pursued at that time. After this behavior resolved, my client purchased the horse. During the couple years my client has owned the horse, she has been used for low level dressage. She works with a reputable trainer who has helped improve her rideability, flexibility and strength. Her saddle was been professionally fitted and she has received regular massages. She received a complete oral exam with floating yearly. She was diagnosed with PPID and arthritis in the right front leg. Her PPID is well managed with Prascend, and she moves well on Equioxx. Over a year ago, she had some cinchiness when girthed up, and owner treated with a month course of ranitidine for suspected gastric ulcers. No gastroscopy was performed at that time, and the cinchiness resolved with the course of ranitidine. In October 2017, Sarah began to have similar episodes when tacking up but the episodes were significantly worse. They happened about a couple times per week, and were not related to the same action. Sometimes it happened when grooming, or applying girth or polo wrap. She became nervous, spooky and reactive. Her skin twitched violently, as if trying to get rid of flies although none were present. She swished her tail and pinned her ears. These episodes started happening shortly after a less knowledgeable rider tacked her up a few times, so the owner believed it was possible that person moved too quickly or did something to spook the mare. After a few of these episodes, the owner and trainer were the only ones to groom and tack her, but they continued to occur. The owner had her former veterinarian evaluate the horse. Lameness, ocular and neurologic exams were performed and were unremarkable. Blood work, including metabolic values to evaluate response to Prascend, were unremarkable. The owner elected to pursue complementary medicine. Sarah presented on November 15, 2017 for chiropractic and acupuncture. Her neck was stiff and seemed sore bending in both directions, temporomandibular joint (ST7) was sore bilaterally. Both scapulae had decreased caudal motion. She was extremely sore and reactive on any lateral motion of her thoracolumbar spine. She allowed her stifles to pop instead of flexing her sacraliac joints. Trigger points were found in her cranial cervical region and deltoids. Her hamstrings were extremely sore on palpation. Inner bladder points palpated sore. On that date, we decided she had too much generalized body soreness to pursue chiropractic. 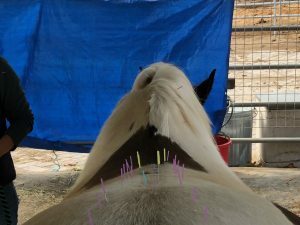 Acupuncture was performed, and although she seemed to enjoy her treatment, she was very reactive at the placement of some needles, so not many were placed. Laser was performed at LI18; along the inner bladder line in the withers, thoracic and lumbar regions; and to the hamstrings. Acupuncture was performed again on November 22. Owner reported improvement over the previous week, and exam showed improvement in the above findings. She was treated a third time on November 29, again owner reported clinical improvement the previous week. Her body soreness had improved enough that chiropractic was performed that day as well. She had several subluxations, including both sides of her pelvis, lumbar, cranial cervical and poll regions. Acupuncture was performed after adjustments. At both of these treatments, more needles were tolerated. Laser was performed on her thoracolumbar and hamstring regions. Owner elected to have gastroscopy performed to look for gastric ulcers on December 6 due to her previous history of suspected ulcers. She had one mild episode the previous week while applying the polo wrap. Twitching started in her lower leg and travelled throughout her body, but resolved fairly quickly. Repeat exam showed further improvement in generalized body soreness. Sedation with detomidine was required for gastroscopy. One linear glandular ulcer was seen but was unlikely the cause of the behavior. A 28 day course of ranitidine dose at 6.6 mg/kg orally three times daily was prescribed. 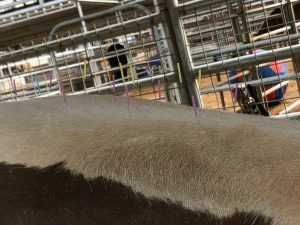 Because the mare had been reactive to the needling at previous visits, acupuncture was performed while she was sedated. Many more needles were placed at this visit. The owner reported significant improvement after that visit, and acupuncture was repeated on December 13. Significant improvement in body, hamstring and bladder point soreness. We decided to treat with a course of gabapentin dosed at 15 mg/kg orally three times daily. Shortly after starting, owner decreased to twice daily due to some sedation from the medication. Routine oral exam and tooth floating was performed on January 10, 2018. Owner reported significant improvement while on gabapentin. She was sedated with detomidine and butorphanol for her dental, and again acupuncture was performed while sedated. Exam before sedation showed no soreness on palpation of thoracolumbar bladder points and greatly improved lateral motion throughout the spine. Again many needles were placed at this visit. We elected to perform weekly treatments on Sarah initially due to the severity of her body soreness and clinical signs. The plan was to do 4-5 treatments once per week, then decrease to every other week for a few treatments before decreasing to monthly treatments. This schedule was not followed closely after the initial series because of how well she responded to the initial treatment and the owner’s finances and schedule. Differential diagnoses included windup pain, cervical arthritis, kissing spine, myopathies, gastric ulcers and body soreness secondary to a lameness issue or poorly fitting saddle. Cervical arthritis would be unlikely to present with this much generalized body soreness, and no neurologic deficits had been seen by the previous veterinarian (repeat neurologic exam was declined by the owner). Cervical arthritis would explain some of the neck stiffness seen after much of the pain was relieved, but diagnostics have not been pursued. Kissing spine tends to cause back pain more over the spine than the musculature, and tends to be more localized to the affected area. Radiographs were discussed, but the owner elected to pursue symptomatic treatment with acupuncture. Radiographs would have been pursued if Sarah did not respond well to acupuncture, and may be pursued in the future if severe episodes return. Myopathies were considered but the affected horses often have more issues with exercise than tacking up. Her muscle values on her serum chemistry run by the previous veterinarian were also within reference range, which doesn’t entirely rule it out but made it less likely. Gastric ulcers were pursued diagnostically, because she had previously seemed to respond well to a course of ranitidine. Although gastroscopy did show a linear glandular ulcer, it was not thought to be the cause of the behavior. Body soreness secondary to a lameness issue or poorly fitting saddle were discussed as well. Owner had full lameness evaluation done by previous veterinarian and declined another one, but no significant lameness was seen at that time. Her saddle had recently been professionally fitted by a very reputable saddle fitter. Due to some of her strong reactions to palpation of sore areas and clinical history, windup pain was her diagnosis. The following points were treated on these dates. Most points were dry needled with either Seirin J type blue needles, 40mm length, 0.20mm diameter or Seirin J type purple needles, 40 mm length, 0.25mm diameter. Huatuojiaji points were dry needled with Seirin J type yellow needles, 40 mm length, 0.18mm diameter. ST7 needled with Seirin J type red needle, 15mm length, 0.16mm diameter. Electroacupuncture was not performed due to the mare’s reactivity and temperament. • November 22: Bai Hui, GV14, GB21, LI16, LI18, BL21, BL23, BL25. BL27 and BL36 were very reactive so needles were not placed. Laser performed on hamstrings. • November 29 (chiropractic performed before acupuncture): Bai Hui, GV14, GB21, LI16, BL23, BL25, BL11, 12. BL21 attempted but mare kicked out when needled. Laser performed on thoracolumbar musculature and hamstrings. • December 6 (sedated): Bai Hui, GV14, GB21, LI16, LI17, LI18, BL11, BL12, BL13, BL21, BL23, BL25, BL26, BL36, BL37, BL40, ST36. Tight band near SI9. Huatuojiaji points L4-6. • December 13: Bai Hui, GV14, GB21, LI16, LI18, BL11, BL12, BL13, BL21, BL23, BL25, BL40, ST36. Huatuojiaji points from T16-L5. (1000Hz) was used for 3-5 minutes per site to relieve muscle tension and pain. The client reported improvement after every session, and each myofascial exam showed less soreness and more motion in the restricted areas. Sarah has remained comfortable since her last treatment on January 10, and she was weaned off the gabapentin a couple weeks after the last session. Her owner reports she is still doing well and plans to maintain her with acupuncture as needed. This mare happened to be one of my first regular acupuncture cases. Although I did not perform the diagnostic workup before acupuncture myself, I trust the opinion and findings of that veterinarian. I am confident that had I been the one performing that workup, I would have also been unable to find a “Western diagnosis” for her behavior. On standard palpations, she did not react particularly sore so I probably would not have thought much of them, but the manipulations of the myofascial examination were unbearable for her. Without complementary medicine, I fear that this horse would have continued to be in pain and the behavior she displayed would have escalated to the point of being unsafe to be around.